This is one of the questions we frequently hear from our visitors. Though we have explained this in various posts and comments, here we want to make it clear again for the sake of our new visitors. “Why people call Exide Home UPS as ‘Exide Inverter’, is it an inverter or UPS. Which one should I buy, UPS or Inverter for home use? Inverter is a device which converts DC power in to AC power. For example:- A single battery 12v inverter will convert 12 v battery power in to 120 or 220 volt AC power for utility. A typical inverter doesn’t have inbuilt battery charger like UPS. Normally this kind of device is not so popular in India; this device is popular in countries like US, UK and Australia. Normally they use inverters with solar PV devices. You may know this definition already, but here I want to describe something more about Home UPS device which we use in India. This is the simplest way to describe the UPS device we use for home in India. Yes, UPS is nothing but inverter with inbuilt battery charger. UPS connected with lead acid battery gives instant power backup for utility during grid power failure, and it charges back the battery when grid power supply resumes. So, it is evident that 99% power backup devices we use in India are really UPS devices. Then why people are calling these gadgets as ‘Inverters’? People of India get used to call all home UPS systems as ‘inverters’, nothing wrong with it. 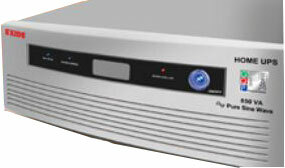 UPS has inverter + battery charger inbuilt with it, so people call it as ‘Inverter’. Microtek inverter, Luminous inverter, Su-kam home Inverter, Exide Inverter – all these devices are officially named as UPS, not inverters.